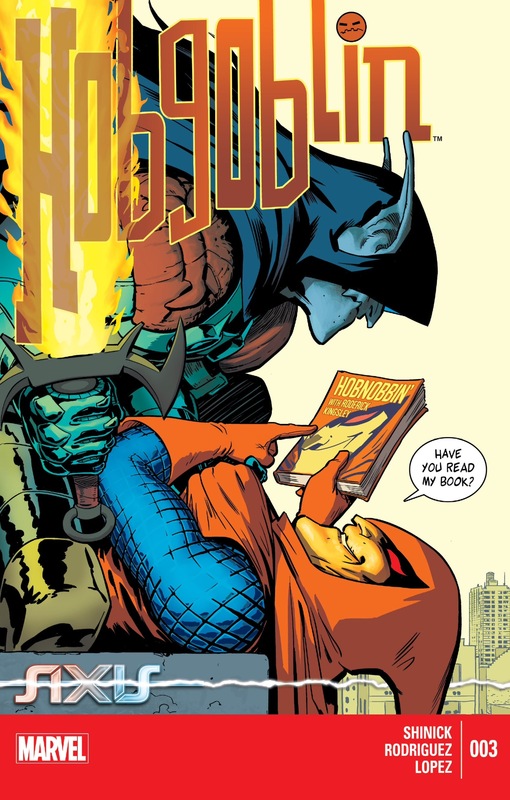 The relentlessly funny Axis: Hobgoblin miniseries reached its finale last week, ending on a somewhat inconclusive note that gives me hope that perhaps there’s life after Axis for Roderick Kingsley (as long as Kevin Shinick and Javier Rodriguez remain the creative team). Even when the third and final issue wasn’t firing on all cylinders – the ending specifically seemed almost tacked on as there was clearly some clunkiness in trying to connect it back to the main Avengers & X-Men: Axis event – this comic was such a good time I’m willing to overlook some of these hiccups. Axis: Hobgoblin #3 demonstrates that Kingsley, as has been his MO since being revealed as the Hobgoblin in the late 90s during the Hobgoblin Lives miniseries, remains the smartest main the room, constantly staying one step ahead of both his adversaries and his potential detractors. 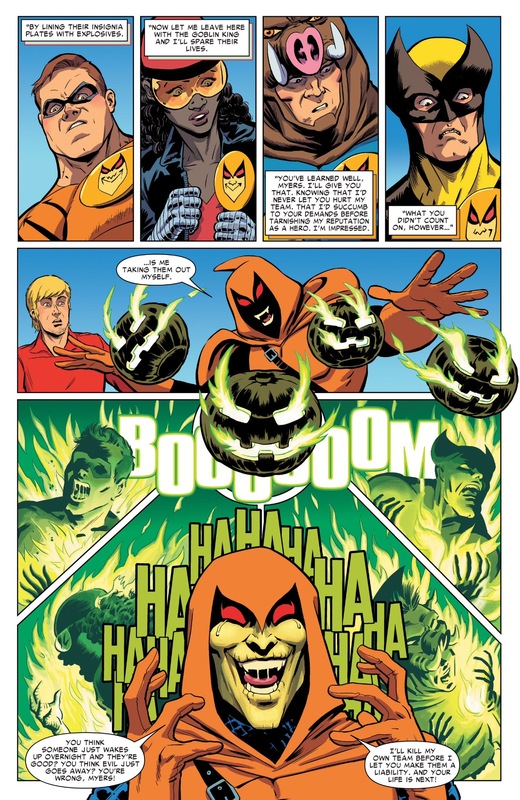 I realize that for some, Kingsley’s innate ability to survive, whether it be through brainwashing stand-ins as the Hobgoblin, or in the case of Axis: Hobgoblin #3, the use of holograms, is growing downright tiresome, but Shinick’s script makes such a game out of how good ol’ Roddy is going to prevail over the bumbling Phil Urich in this comic, I honestly can’t get enough of all of the sleight of hand/bait and switches that accompany this character. If we’ve learned anything over the past few years is that Kingsley is a businessman first. 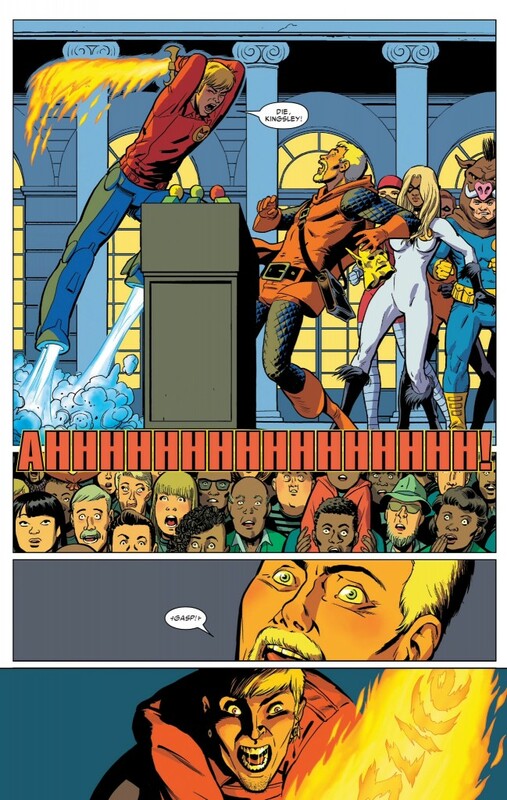 And because, unlike some of the comic book world’s other megalomaniacal industrialists (Norman Osborn for one), Roderick still seems to have semblance of sense left (or perhaps he’s just the least insane), it’s safe to assume that regardless of the situation, this is a character that is going to value the bottom line and his return on investment first and foremost. In the case of Axis: Hobgoblin, that means protecting his new successful hero-making franchise at all costs, ironically enough even if it comes at the expense of public perception. Once Kingsley finds the mole in his ranks in this comic, his vengeance is swift and merciless, even in front a crowd of people who were only just celebrating Roderick a few pages earlier. That might seem like a rare misstep, but again, Kingsley is the smartest man in the room and he perseveres, his business in tack. 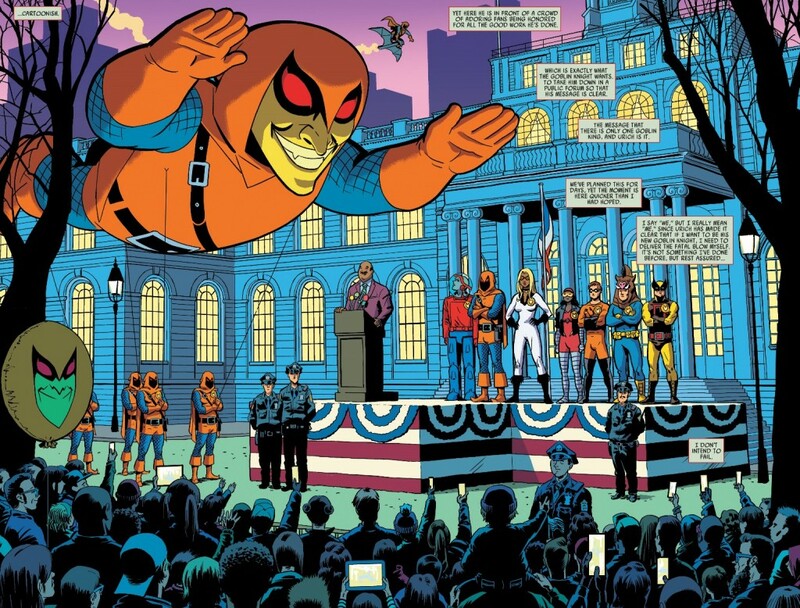 I doubt anybody is going to be giving him the key to the city again anytime soon (complete with a giant Hobgoblin balloon), but Kingsley’s enterprise has not been shut down – hypothetically keeping the door open for another miniseries or some kind of storyline involving Hobgoblin. If this book has any large scale deficiencies, it was the lack of a quality opponent for Roderick to go up against. Without Spider-Man in the picture, Urich, a character that has fallen so far from grace his picture is going to show up in a dictionary next to the phrase “rock bottom,” was a less than ideal option for Shinick and Rodriguez to run with. When you take into account Kingsley’s uncanny ability to always win, pairing him off with a villain like Goblin King Phil never truly put the outcome in doubt (even when it appeared for half a second that Lilly Hollister had turned on the Hobgoblin’s crew). This is really no fault of the Axis: Hobgoblin creative team, as Urich has been stuck in this character purgatory for quite some time now, but a guy’s gotta dream that perhaps the next time around Marvel shines the light on Roderick like this, a true A-lister like Norman Osborn or someone a few ticks below in the feeding order could be lined up as the big bad. And that, of course, is to assume there is a next time. I am at a bit of a loss to predict what exactly is going to happen to all of these characters that were “inverted” as part of Axis a few months back. Both the Hobgoblin and Carnage miniseries ended on equally perplexing notes that hint that the old status quo has not been restored, but that the Axis-induced changes are also not long for this world. 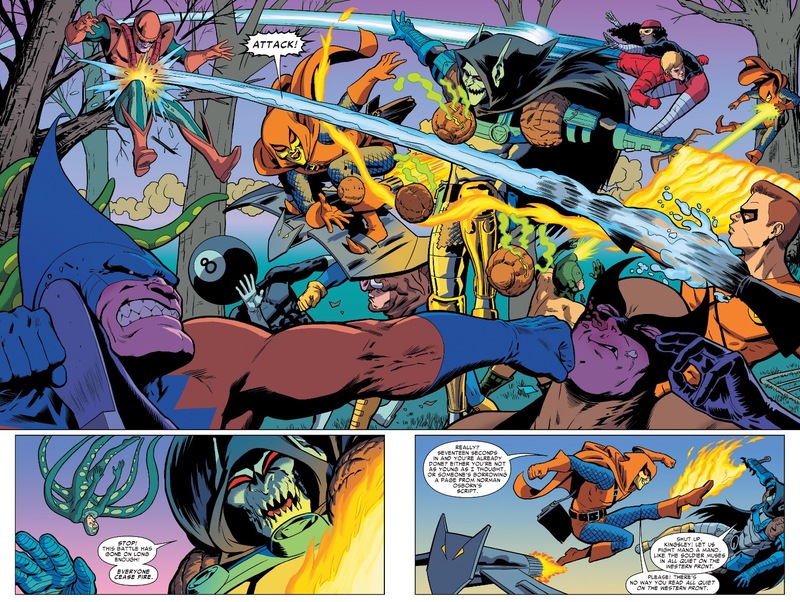 This situation is further muddied by the fact that Axis: Hobgoblin #3 ends with a teaser to Avengers & X-Men: Axis #6, a comic that’s now a few weeks old. I’m assuming that there will be some stab at explaining the next steps for these characters – Secret Wars is also around the corner to blow up the Marvel status quo – but Marvel needs to do a much better job of tying together all of these dangling loose ends over the coming weeks.